Somewhere between heaven and the underworld - in the center of a quiet lake - stood an ancient castle known as Aventheim. One night, without warning, denizens of the netherworld emerged and slaughtered the kingdom; nary a soul was left alive. Within an abandoned, long-forgotten church deep in the woods, a wisp is set free. 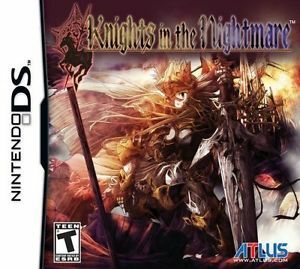 Bereft of memory, it is drawn toward the monster-infested castle and re-awakens the souls of the vanquished knights, leading them back towards the fallen stronghold to confront the very forces of evil that took their lives. An experience unlike any before it - Incorporating strategy RPG, real-time strategy, and shooter elements, you've never experienced a game like this. Control a Wisp with your stylus and activate the souls of deceased knights to aid you in destroying foes on the map. Enemies fire bullets in multiple directions, making it vital for players to master the unique touch controls.